Who, exactly, was this Charlotte and what did she do to get a quaint Islay village, not to mention a whole series of well-regarded scotches named after her? A strong-footed mid-fielder for Wemyss United who scored that stellar, curving goal for the win over Askaig City FC in the ’46 All-Islay tourney finals? No. A mythical sea-sprite said to guide lost sailors safely home by waving towering bricks of smoldering peat over her head, thereby burning off the obfuscating fog? No…sadly, no. It turns out she was the wife of Lord Frederick Campbell, a nobleman and parliamentarian who at one time was the Keeper of the Privy Seal of Scotland, whatever that it is, and well-known throughout the Hebrides for his delicious pies (made that last part up). Lady Charlotte was not just another trophy wife for those social ladder climbing Campbells, she was a prolific author and wrote The Diary of the times of George IV which is still published today. 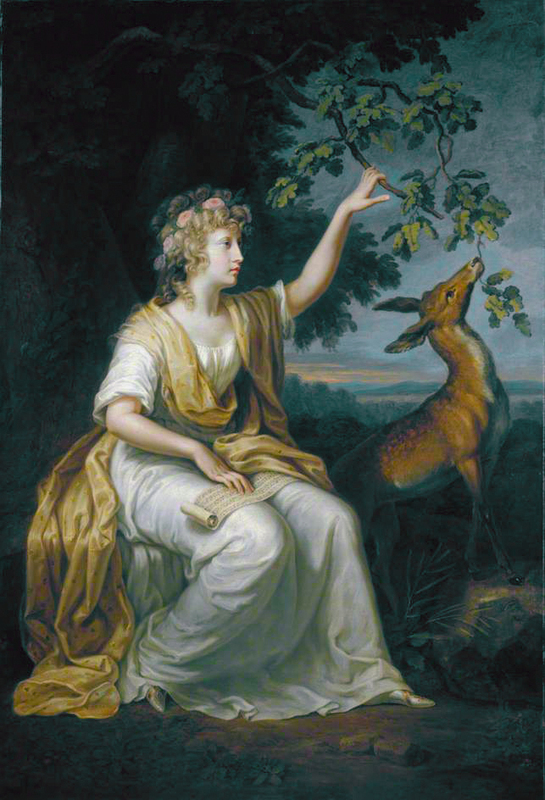 She also, guessing from the picture below, had a thing for deer and liked nothing better than to feed them at dusk whilst reading from scrolls. 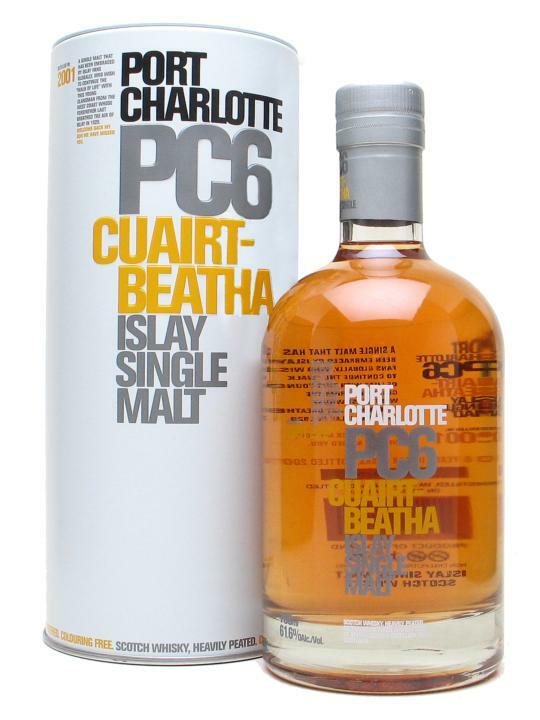 In honor of Port Charlotte’s strong ties to the distillery, Bruichladdich’s Port Charlotte Series is heavily peated compared to most of their usual offerings and began with the PC5, a five year old, which was distilled in 2001, the first year of operation after the extensive renovation of the distillery. PC6 (a six year old, surprise, surprise) followed the PC5 and was itself followed by the PC7 and 2009’s PC8. The Nose: A surprising, honeyed, slightly bourbon nose, ripe Bartlet pears. There’s a lot of smoke here, but not as intense or forward as I was expecting. It’s fireplace smoke from the next room over, very warm and inviting. A good, dirty peat smell as well…maybe there are some sock drying over that fire. The Palate: Sooooo much alcohol and such strong medicinal peat hits right away, it would be overwhelming if not for the great balance of ripe, soft pears and honey. Both the peat and sweet just sort of bloom with a wonderful, viscous mouthfeel. Really delicious. Waves of rich smoke roll on and on, building towards the finish. The Finish: Nearly perfect. Long with lush smoke and slightly bitter phenols. Thoughts: Pretty damn impressive. I’ve been looking forward to trying this for some time and it did not disappoint. It is, in some ways, an exaggerated Islay, almost a caricature in that it’s so strong and peaty, but not in the cartoonish way the Octomore is. It’s big and bold, but also tempered by some really smooth sweet notes that are really well-integrated into both the nose and palate. A very rich, powerful, lush dram, surprisingly smooth and balanced for only 6 years old. I’m guessing this one is disappearing, perhaps quickly, so it’s well worth a glass or even a bottle if you see it around. I love the PC6. You can still find a couple of bottles at BevMo in Colma for $99, which is a great price. The 5 is the tough one to get your hands on. Cripes…$99? That’s 50 bucks cheaper than I’ve seen anywhere else. Very tempting. Have you had the 7 or 8 yet? Wow! I remember seeing it in San Francisco for $99 at BevMo in, like, 2011 which was surprising, but for it to still be around…impressive. Where did you see it and did you pick up a bottle? (or do you not want to divulge your dusties dealer?). Four years ago…jeeez. I remember liking it quite a bit then, when I was younger, more impressionable, and less cynical. I wonder if I’d still feel the same way now. I just had some of this last night. I fell in love all over again. And, $99 for it?? I’m in! Oh, Bevmo doesn’t ship to Connecticut. Crap. This is a very tasty whisky! Especially for a 6 year old. Definitely packs a wallop in the alcohol and flavor departments. PC6 was the best so far out of all these releases, and I don’t expect them to get any better as they get older. This style of Islay Scotch just does’nt seem to get better with age past the 2007 release. PC5 came close, but did not have the richness of the PC6. That extra year seems to have made all the difference. PC7 was good, but still did not match the overall flavor and feeling in the mouth as the PC6. As far as PC8 and PC10 are concerend, they were major dissapointments compared to the PC6, and I would not suggest wasting your money on these, since there are many other bottles out there that will deliver better, and at a more reasonable price. You would be much better off with a $90.00 bottle of “Ardbog”, a $65.00 bottle of “Big Peat”, or even a $55.00 bottle of the “The Laddie 10”. All of whcih are still easy to find and reasonably priced for quality Islay Scotches. PC6 on it’s own is amazing, but if your truly want to achieve full Islay Scotch Nirvana, try first preparing your pallet with a little Big Peat, followed by a little Ardbog, and then go into the PC6. The flavor at that point is unbelievable!!! “Butterscotch, Sea Salt, Smoked Bacon Fat with a rich oily Sherry finish. It’s really one of the best Islay Scotches I’ve had so far. I even thought it was better than the 10 Year Octomore, which is double the price. Octomore may be the most smokey, but it does not have the surprise, complexity, and overall taste/mouth feel of the PC6. I purchased 8 bottles of PC6 a while back for $100.00 each at BevMo, if you can believe that. BevMo did’nt even have a barcode in their whole database for PC6, so this was a lucky find. Currently, Scotch enthusiasts in the UK are buying these bottles here and there for 400 pounds, which works out to be nearly $600.00 US. I kept two of the PC6 bottles for myself, and the other 6 have bascially been financing all of my other Scotch, Rye Whiskey/Bourbon ventures, and will continue to do so for a good 2-3 years. Thanks for the comment SoS! Yeah, I remember when BevMo had PC6 for $99.99. At the time, I thought it better to spend the money on things I hadn’t tried, in hindsight, I wish I had picked up a couple of bottles. I’ve had the PC7 which I enjoyed quite a bit as well, but I haven’t had any PC’s since then. I definitely steer clear of over-priced gimmicks like the Octomore, if I spend money on an NAS Islay, it’s probably going to be an Ardbeg…until they get priced out of the realm of reason.